Part of what I love about living in a city is the wide, wide variety of food choices available for us out there. 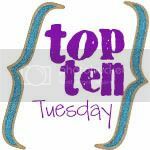 While smaller cities like Roswell and Alpharetta have larger food choices to pick from now as their towns have grown, nothing really beats Inside the Perimeter (ITP) for the largest variety. 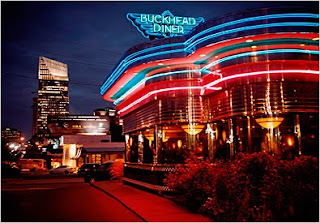 On Saturday we hit up one of my all-time ITP favs, the Buckhead Diner. Not your typical diner, the BHD serves up glam food in a glam environment. While I have seen people wear their "street clothes" (oh the faux pas! ), usually the crowd is dressed up, and the service is exceptional, making you feel like a celebrity. I have fond memories of this Atlanta mainstay with family, so it's a treat to live so close to it now! We had two of my FAVORITE dishes in town -- the Sweet and Sour Thai Chili Calamari and the White Chocolate Banana Creme Pie. Oh my goodness. I also tried the Grilled Mahi Mahi Tostada (omg) with White Cheddar Stone Ground Grits (omg), and Guacamole and Pasilla Chile Sauce (omg). Can you tell how much I enjoyed it? Thinking about the Diner and these dishes makes me think about the other dishes that I LOVE around town. Remember when I mentioned that if there is something on a menu that I love, I order it every time? Sometimes -- sometimes -- there is a special or a new menu item that catches my eye. It's hard to go wrong at these higher-end places, after all, since the food is so great. But usually, I like to stick with what I already know I love. Because honestly, if we are going to dress up and go out for a special meal and pay top price, I want to know that I am going to love it, 100%. A list of great food is perfect for Atlantans and visitors alike. You know that Food Network show The Best Thing I Ever Ate? Consider this your local edition straight from me. Note: I am sticking with the mid- to higher-end joints, because I'd never be able to pick only 10 if I was allowing pizza, BBQ, and other under-$10 destinations! Like the Best Thing show says, feel free to agree or disagree with this list. That's why there are so many items to choose from on the many menus around town -- there is something on them for all of us! This list is in no way all-encompassing. 10. Flying Biscuit Cafe (multiple locations): Egg-Ceptional Eggs. Black bean cakes + over-easy eggs + feta + tomatillo salsa = brunch genius. Get it with the salad; you won't be disappointed. 8. TAP 1180 (Midtown): The Mediterranean Flatbread with goat cheese, roasted vegetables, lemon confit, and pesto is a delightfully light meal, and a perfect pair to their Numbers Ale. 7. Ormsby's (Westside): I kid you not -- ignore the menu and go with Uncle Fred’s Ultimate BLT. It has Applewood bacon, tomatoes, lettuce, homemade mayo, and sunny side up eggs, all on toasted country sourdough bread. Get a side of fries WITH GRAVY, New Jersey-style. Kill me now. 6. Twist (Buckhead): This has and always will be a top-summer meal for me. Crisp Calamari Salad with Radicchio, Iceberg, Frisée, Cashews, Hearts of Palm, Bananas & Citrus Vinaigrette. To die for. 5. Pasta da Pulcinella (Midtown): I hate that I am revealing this secret of a perfect date night place with you... But what fun is keeping a secret from my friends when you can enjoy it too? While the entire menu is tempting, my eyes always go straight to the Tortelli di Mele, ravioli filled with browned Granny Smith apples, sausage, and parmigiano, topped with browned butter, sage, and an apple cider reduction drizzle. YUM. 4. La Tavola (Highlands): The Tagliagtelle Bolognese is something that my whole family swears by when we eat here -- this could easily be a family secret recipe straight from Italy, it's so hearty and tasty. 3. Pozole (Highlands): While most of these restaurants are long-time favorites of mine, Pozole is brand new. Why? Their Green Mole Enchiladas. Whether you go meat or vegetarian, both are amazing. 2. Antico Pizza (Midtown-Westside): I lied. I can't pick a favorite here. Every single pie they make is fab, as are their cannoli. Go wild. PS. Love the Napoli song on the website. 1. YOUR pick. What's your favorite ITP meal in town? Share the restaurant love with us! Kelly - re: 4th&S, you all might have to double date with us there some time, as I have been DYING to try it!! Yum! Have you ever been to Panahar? It's Bangladeshian (similar to Indian) and the wait staff is the friendliest I've ever met! It's a little hole in the wall on Buford Highway (between N Druid Hills & Clairmont) but it is soo good if you like ethnic foods. It's also BYOB (with no corking fee!) so it helps to keep the costs down when you can bring your own favorite beer or wine to drink. You should definitely give it a try sometime! I used to live in Buckhead and didn't find out about it until I moved to Smyrna, but the 15-20 minute drive is totally worth it! Jenny - I have heard such good things about Panahar!! I am going to put it on my short-list of places to hit up soon. And BYOB with no fee is clutch, I love when restaurants offer that. Thanks for the suggestion! !